Some details about Buddhist holy places are from indiatravel.com, which also gives distances from major cities to aid location. The original map, which I edited to remove roads, state boundaries, and railways, was released to the public by the Central Intelligence Agency. These sixteen nations at the time of the Buddha are named in the Visākhā Sutta of the Uposatha Vagga, in the Book of the Eights. Visākhā was born in the city of Bhaddiya, in the country of Aṅga, which seems to have been part of the Magadha kingdom. Magadha was the kingdom of Bimbisāra and his son, Ajātasattu. Bārāṇasī was the capital city of Kāsī, a region famous for its silk. Kosala was ruled by Pasenadi from his capital Sāvatthi. The Buddha spent many Rains Retreats in the Jeta grove near Sāvatthi donated by Anāthapiṇḍika. The Vajjī kingdom had its capital at Vesāli. The Buddha spent his final Rains Retreat at Beḷuva near Vesāli. The Mallas had their capital city at Kusinārā, where the Buddha passed away. 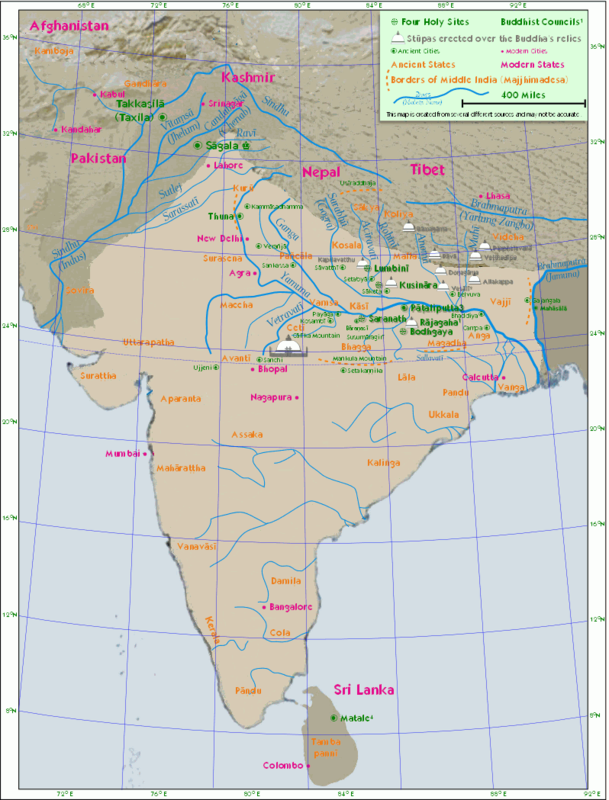 The Kurū kingdom was the region north-east of Delhi. It was here that the Buddha taught the famous Satipaṭṭhāna and Kālāma suttas. Pañcāla was west of Kāsī. Maccha was to the west of Cetī. Gandhāra was famed for its university of Takkasila (Taxila). The name Takkasila means stone-cutting, and this region became famous for its high quality stone Buddha images. Kamboja was beyond the Hindu Kush mountains in what is now Afghanistan. Kamboja was famous for its fine horses. Some information on this map may be inaccurate due to the difficulty of mixing information from various sources. I will be grateful to know of any serious errors or minor oversights so that I can gradually improve it for future editions. The four holiest places for Buddhists are the sites where the four main events of the Buddha’s life took place: Lumbinī, where the Bodhisatta was born; Bodhgaya, where he gained Enlightenment; Saranath, where he gave is first discourse; and Kusinārā, where he attained parinibbāna. King Ajātasattu of Magadha erected a stūpa over the Buddha’s relics at Rājagaha. The Veṭhadīpa brahmin erected a stūpa at Veṭhadīpa. The brahmin Dona who divided the relics fairly into eight portions erected a stūpa over the urn that was used to preserve the relics. So it came about that there were eight stūpas for the relics, a ninth for the urn, and a tenth for the ashes. At Rājagaha, three months after the Buddha’s parinibbāna in 544 B.C. At Vesāli, 100 years after the Buddha’s parinibbāna. At Pāṭaliputta, in 326 BC. At Matale, Tambapaṇṇī (Sri Lanka) in 29 B.C. At Mandalay, Burma 1871 A.D.
At Rangoon, Burma from 1954 to 1956, concluding 2,500 years after the parinibbāna.